The UK academic community can now enjoy full access to crop mapping datasets covering all of Great Britain thanks to the addition of our CEH Land Cover® Plus: Crops dataset to the online Digimap data delivery service operated by EDINA. Over the last five years we have worked with EDINA to make all of our Land Cover Map datasets accessible through the Edina Environment Digimap® service to the benefit of more than 100 higher and further education institutions currently subscribed to this service. 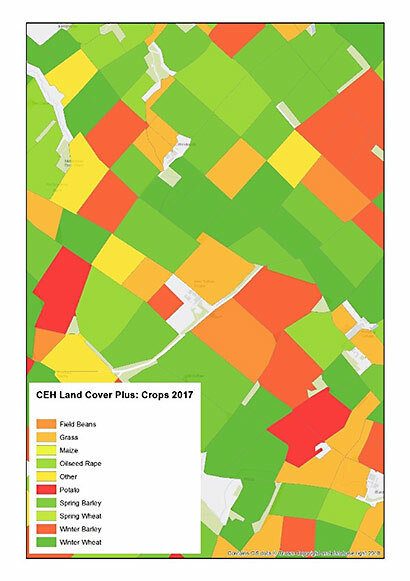 We are very pleased to be adding the 2016 and 2017 national coverages of CEH Land Cover® Plus: Crops to the service, with the 2018 dataset to follow soon. CEH Land Cover® Plus: Crops is an innovative crop mapping dataset produced by the Centre for Ecology & Hydrology in partnership with RSAC Ltd, a company specialising in remote sensing applications. 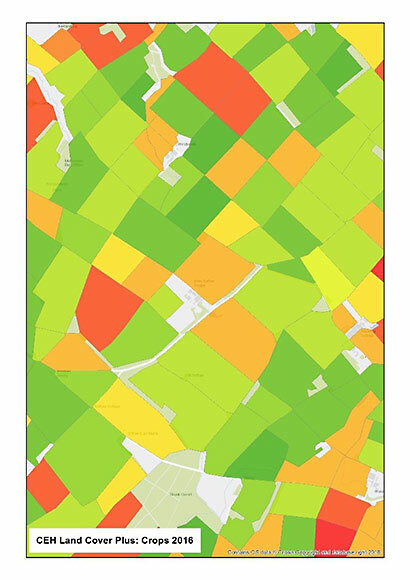 Our crop map provides annual crop information for major arable crops, derived from satellite imagery, on a field by field scale and is the first and only dataset of its type to provide an accurate and complete picture of cropping for the whole of Great Britain. CEH Land Cover® Plus: Crops was originally created with funding from Innovate UK, alongside contributions from CEH and our private sector partner RSAC Ltd and is built on a national parcel map derived from Ordnance Survey mapping. Ensuring that the aims and licensing constraints of all parties are met can be a challenge where support for economic growth through commercial exploitation needs to work alongside our policy of providing free academic access to our datasets. In this situation of potentially conflicting ambitions, the role of Environment Digimap® as a service dedicated to non-commercial research and education allows us to focus on building relationships with the private and public sector, without creating barriers that could restrict access to the academic community. CEH Land Cover® Plus: Crops was developed with an initial planned application in the water sector where it is used to model pesticide sources and transport pathways within catchments. CEH Land Cover® Plus: Crops does, however, have a wide range of other applications within academic research. In CEH we have also used CEH Land Cover® Plus: Crops to provide important context on cropping patterns in the landscape, and it forms the basis of several avenues of research into sustainable agriculture where it contributes to knowledge of agrochemical use, crop diversity and rotation practices. By releasing multiple years of geospatial cropping data for all of Great Britain we hope to facilitate research which has previously been restricted by difficulty accessing national and consistent annual cropping data. Visit EDINA Digmap for academic access to the data.